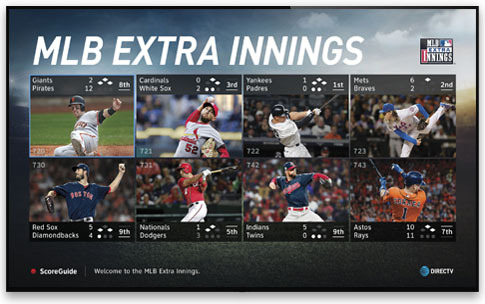 It’s time once again to sign up for DIRECTV’s MLB Extra Innings package. I think it’s the best value in sports programming. Why? Because when you look at thirty teams and 168 games, you realize that for one price you potentially get over 20,000 hours of content. It would take you about ten years to watch all of it if you treated it as a full time job. Compare that with NFL Sunday Ticket which is much more expensive and you’ll realize it’s a great value. MLB Extra Innings gives you every regular-season game. Every single one. Yes, there are blackout restrictions for in-market games. That’s something the league insists on. However, that doesn’t mean you can’t get tons of content! This is the perfect choice for displaced fans, too since blackout rules only apply to games that are close to you. You get every game on DIRECTV, plus the MLB Network Strike Zone channel which brings you a constant broadcast of the top plays across the league. It’s the best way to use your time to see all the action. You also get the Game Mix channel which shows 8 games at once! Even better, you get the MLB.TV package which lets you stream on your phone, smart TV, or streaming device! This package is usually $115 by itself and it’s completely free with MLB Extra Innings. There is a small increase in MLB Extra Innings pricing this year but it’s only $6, taking the price to $177.90. That’s about a 3% increase. Not bad when you realize Netflix just raised their rates by 18% for the lowest package. Of course I’d love to say that they didn’t raise rates at all but that’s really a small bump when you think about it. There’s always a rush when the season starts. The first week’s games are usually free for everyone and that leads to long wait times on the phones and very slow signups on the web site. By signing up now you can avoid all that. Just call Solid Signal at 877.312.4547 or sign up directly at the DIRECTV.com web site. Will commercial customers ever get the ability to share programs between receivers?